While a big part of me is ready for a more refined, clean, and simple design in my home, I find that I'm always drawn to homes that are little more funky and have personalty. My home design is all over the place. It's full of hand me downs and eclectic pieces that I buy for my "future home" (since they don't fit in my current space). I think when I eventually move I will aim for a simple design with a few fun elements. I love how these homes have standout pieces that make you stop and stare. I feel the same way. I find it so hard to pick a style I want for my home, I'm all over the board. I want it super clean and classy but then I want to add in all these crazy colors and elements. These images make me want to completely re-do our space. Absolutely gorgeous! I also feel like I'm "stockpiling" random pieces because someday I'll have rooms where things will coordinate. ::sigh:: These are great, inspiring pics! The spaces that look collected over time are the ones that get me! Love that little french side chair with the chevron...a little pattern sure goes a loooong way in the home...great mix! So relaxed and turn key ready! i wish our home could be so clean & crisp! we live in more of a country/italian style home so these styles just don't fit but i love it so SO much! such great spaces - there are things I love about all of them. Have a great weekend! Oh my those photos are so inspiring..u always know what to put on ur blog..have a great weekend gorgeous.. It makes me want to have a place of my own! I can't wait as well to finally be settled and be able to really go all out when it comes to picking out decor and furniture. 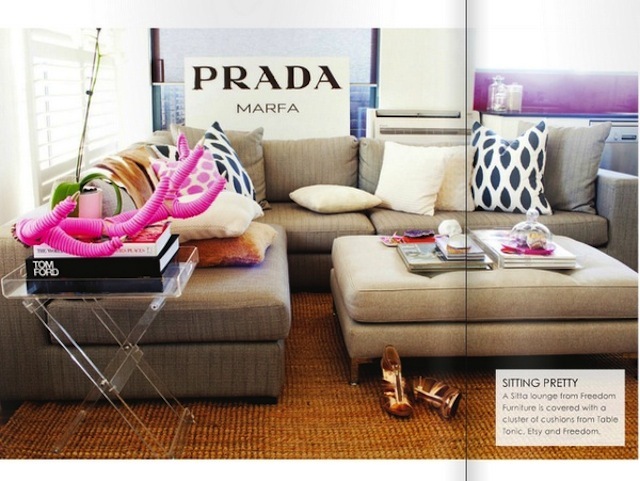 I LOVE LOVE LOVE the Prada Marfa art piece!!! Loved it ever since GG! These are all great examples of simple rooms with a statement piece! Great finds! :) I think I have 3 out of 4 of these images on my Pinterest too. 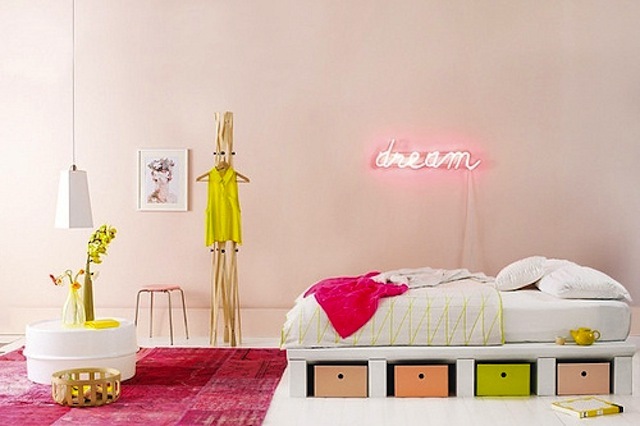 I LOVE that first room and all the pops of hot pink in these rooms really bring life and fun to the space! Wouldn't this be the coolest house to come home to and wake up in!? beautiful photos. also i love the dress in the previous post! All the spaces are lovely! I especially love the bedroom- that dream sign is something I'd love to get. Beautiful spaces, very inspirational! Thanks for sharing! LOL. That's my bus. For 2 years I rode the 19 home from school. As much as I LOVE looking at planned room design, I love my own random home decor... plus not many designed rooms take into account a very fast, curious, and growing baby boy. That neon "dream" sign is PERFECT. Love the colours in the bedroom, including the pale pink of the walls. These are all so inspiring and I agree with you that simplicity is very chic for a home. i'm the same way! my decorating style is all over the place. and what makes it really tough is living in a rental since i can't paint the walls and make it look the way i'd want it to..
i think even when i'm in a real house, i will want a bit of color and quirk in my home! life's too short for boring decor! I am in that same transition... living in a "for now" rental, dreaming & buying things for a new "grown up" place! I don't have a "decor style" either, but buy things that I love (once I save up), and I can see my vision slowly starting to realize itself! Amazing one! This is my first visit on your blog and found awesome blog posts. I'm quite eager to re-publish one image to my blog. What you think about it? This shopstyle is really good!